Bangkok-based idol group BNK48 have successfully held their first pre-senbatsu sousenkyo live concert titled "BNK48 Space Mission" today at Thong Thani Muang Arena. The galaxy-themed concert opened by all of BNK48 main senbatsu members involved in these indoor venue. 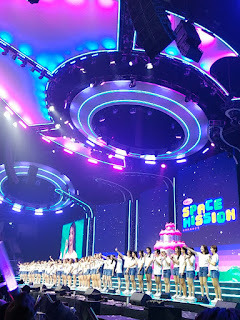 The Space Mission concert were related to their fifth single BNK Festival alongside purple lighstick in a dark indoor arena. MC2. Talking about unit sonv. Meanwhile the final results of BNK48 1st Senbatsu Sousenkyo for 6th single to be announced tonight.